Yesterday, Jenny East and I went to a lecture entitled “Pseudoscience: Exploiting Public Trust”, sponsored by the Phronesis Lab for Engaged Ethics at OSU. The lecturer was Massimo Pigliucce, a professor of philosophy at the CUNY-City College, co-host of the Rationally Speaking Podcast, and the editor in chief for the online magazine Scientia Salon. Some of you may remember his name from when I mentioned in lab (a few times) about one of his books I was reading, Answers to Aristotle: How Science and Philosophy Can Lead Us to a more Meaningful Life and how that got me to reflect on what years of science philosophy and the discoveries of scientific endeavors themselves can collaborate and culminate in new paradigms reflecting new research questions, new theories and new hypotheses. The point of his lecture was to discuss, on historical and philosophical grounds, the conflicting ideas about what counts as real science and as pseudoscience (e.g. Astronomy as a science and Astrology as a pseudoscience), ideas of which culminated in the conceptualization of a “demarcation problem” – the problem of where and how we should draw the line differentiating the two. Sir Karl Popper, who we have learned about in our time here at Graduate School, offered a solution to this demarcation problem by introducing the idea of “falsification,” which suggests that science does not progress by confirming hypothesis but by falsifying them. In this sense he was trying to exploit the power of deductive logic to solve the problems of “induction.” However, as suggested by the Duhen-Quine thesis, it is impossible to test a hypothesis in isolation because each hypothesis is surrounded by background assumptions. Furthermore, Laudan introduced some metaphilosophical considerations to the hinge on the demarcation problem. Laudan discussed what conditions determine adequacy, the necessary and sufficient criteria and what judgments are implied. Beyond the philosophical thought development made so far, the demarcation problem is still under scrutiny. Massimo talked about the scaled approach where some sciences are widely accepted as science already since there is enough empirical evidence, some are placed in transitory stages as quasi scientific fields in development and some are just simply termed pseudoscience for the lack of collected empirical data. Thinking broadly about disciplines that may or may not fit in the scientific category made me take on a more focused line of thinking within the science endeavor itself and the questions of methods and scientific process. Say qualitative vs. quantitative approaches. I would say there is a demarcation problem there too, which is fueled by conceptualizations of the steps involved in the scientific process and traditional understanding of what it means to do science. Qualitative approaches are answering different questions than quantitative, placing them at the center of paradigmatic shifts about the nature of science. It is my personal belief that qualitative and quantitative methods are complementary for the advancement of science and our understanding of the world, almost an analogy to what Massimo discusses in his book about the complimentary nature of the scientific and philosophical fields to lead us to more meaningful observations about the world. The basis for how we separate science from pseudoscience is analogous to the basis of the latter discussions of methods accepted as scientific methods and worthy of trust. Both “demarcation problems” are cultural constructions materializing as concepts get defined, new ideas are born and naturally derived debate comes to surface as we try to make sense of things and establish rules. Like in any other dimension of social life and different social institutions (family, school, etc), we create rules and follow those rules until they are revised and changed, often by revolutionary paradigmatic shift, it is our way to avoid chaos and continue to just “be” in the world. In its very beginning, wasn’t science a branch out of philosophical thinking anyway? But, throughout the years, it became so acculturated in its own development, rules and essence that it was separated from the philosophy field to gather the empirical ways in which we can be almost “certain” about things in the world, and it does indeed provide us with that data, like finding a needle in the pile of hay with a magnifying glass. While philosophy sets up the center stages of debate about the broader questions, the stages for agreements and disagreements the very process of “thinking” unravels in the collective mind of society, like looking at the entire barn that stores all that hay. The questions of philosophy fascinate me just as much as the questions of science. For me the demarcation problem is a sign of healthy development in the individual minds and the “collective mind,” which ultimately establishes what we know about the world, the ways we seek that knowledge and, more importantly, the way we change those ways of knowing and seeking knowledge. For me, things get unhealthy when that social collective mind close up to these possible changes and new incorporations of thinking for reasons short of educated assumptions, curiosity and plain respect for the very capacity of science and philosophy as interrelated fields. Oh boy…I just realized I have too much of an inclination to philosophical thinking, which may make it hard for me to be seen as a solid scientist. But I also love science and what it is all about, which does not leave much room (in practical terms) for a philosopher to stand in the current state of world affairs. Posted in Philosophy, Philosophy of Science. I am a marine educator from Brazil, an Environmental Education Ph.D. candidate who is passionate about the fascinating world of ocean sciences, informal education, and capacity building for science communication. I am also a mom, just as passionate about experiencing nature through the curious and adventurous eyes of my two daughters. I am a diver and the ocean is where I feel most at home. 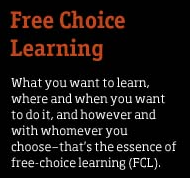 What is free choice learning? © 2019 The Free-Choice Learning Laboratory at HMSC, all rights reserved.